Cut slits into the roast, about every 3 inches or so, but do not pierce all the way to the bottom. Place garlic slices into the slits. Season Roast all sides with the Salt, Black Pepper, and Cayenne taste. Some folks like a lot of Cayenne, some folks don't. Heat the fat or oil (fat has more flavor, but oil will work also.) in a Dutch Oven that has a pretty heavy bottom over high heat. Once the oil starts to smoke, carefully add the Roast with the side that you cut the slits in down in the pan. Brown the roast very well on all sides, but watch carefully so it does not burn. Transfer to a plate. Drain off all but 1 Tbsp of the fat or oil in the pan, add the onions. Only cook the onions until they are almost brown, being careful to not burn. Put the roast back in the pan, then add all the stocks. If needed, add enough water to bring the liquid to about 3/4 of the way over the top of the roast. Add all the rest of the ingredients. Bring it all to a boil, then lower to simmer. Put a lid on it, and slow simmer for about 3-4 hours or until the meat the meat starts falling apart. You can really tell by looking at it. Make sure to cut the meat into very tiny slices, as well as you can. It will most likely fall apart, but that is the good stuff, which is the debris. Add all of this to the cooking liquid after skimming off the fat from the surface. Place the carved meat with a little bit of liquid on a warm plate, and cover it tightly with plastic wrap. Bring the gravy to a full boil and then slowly reduce it until it you see that it coats the back of a spoon. Season to taste with salt and pepper. Cut the bread 3/4 of the way through, do not cut all the way through, as this makes it easier for handling it! Generously spread the Mayonnaise on the inside of the upper and lower halves of the bread. Place about a cup of Shredded Lettuce on the bottom half. Add tomatoes if desired. Cover the tomatoes with as much of the beef as you can. Then slather it with the Gravy. 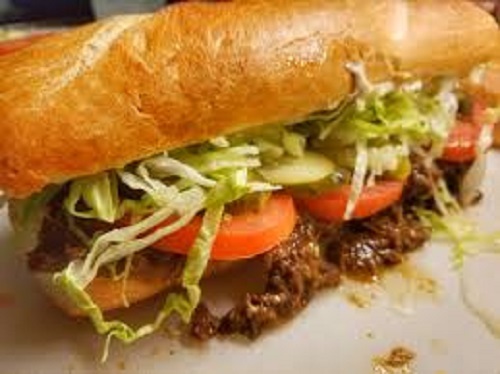 Makes about 4 delicious roast beef po'boys with gravy.